Presented by the Technology and Society Lecture Series & the Intermedia Arts Program of Mills College, the world-renowned director will reference his original works for the stage such as Deafman Glance, A Letter for Queen Victoria, Einstein on the Beach (created with composer Philip Glass), the CIVIL warS, and The Black Rider, as well as his acclaimed work for operatic and theatrical repertoire including his luminous stagings of Madame Butterly, Wagner’s Ring Cycle, The Magic Flute, Ibsen’s Peer Gynt and Heiner Mueller’s Quartett. At the conclusion of the event, the audience will be invited to explore Mr. Wilson’s ideas further during an informal question-and-answer period. 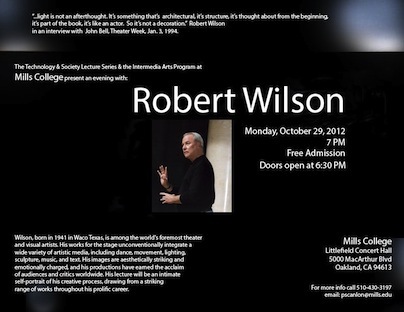 The extended solo presentation provides the public a rare opportunity to learn more about Wilson and his process. Wilson will share his vast aesthetic universe, combining hundreds of striking images from throughout his prolific career to offer an intimate self-portrait of Wilson’s creative process. Wilson appears in the Bay Area for the restaging of his epic and legendary collaboration with Lucinda Childs and Philip Glass, Einstein on the Beach, which will be presented by CalPerformance October 26, 27, 28 at Zellerbach Hall on the campus of UC Berkeley.